can’t wait too :O good job guys! so thats the solution for your “keyless”-system …. And no, Is not the same: we are not trying to make a new game, but to allow people to play FEAR Combat. what are you talking about? who was talking about an unfair life? we were just saying that it was you who complained about infear being MasterServer & CDKey dependent. And now your solutiono for this, is to make a Server-Side-Mod and your own CDKey-Page, thats not the same as infear indeed, but it is exactly the same aproach. that’s why I said that. I didn’t want a solution like this at first, but since I’m not the main developer, It was not only my choice. But It turned out to be a very reliable one, you will see when the time comes. Yeah, the aproach is basically the same, but the difference, is we are not trying to kill FEAR Combat to make people play our own game, but allow new players to join the existing game. Whip I am broken down.My pc is out of gas lol.Ask Fred what I was doing as well as I will send u a link to my private to see the template i was working on.Now all help is needed on this as I cant do anything until i fix my pc.I am sure you an others can pull this off to help us revamp FEAR once again. Well,think u missed understand something,i’ve said we aren’t supporting a game of a shamed publisher like warner anymore. Due to that we’ve decided to change the name. Also to update that parts we’ve planned it isn’t possible without localize the system. But n1 to need more than 3 months to do nearly the same we had done within a week. OK, I’ll be on xfire later this afternoon. I have been busy the last couple of weeks but I will do my best. @HassL, the publisher run away with the money, we know It. But that’s something good, since we no longer can expect anything from Sierra, Activision, WBGames or Monolith. We are in our own now. I have always think your idea was good, but to be honest the cost to make It work was too high ( make existing players quit FEAR and play INFEAR). Our way is, I think the one that can allow more people to keep playing, existing and new users. Maybe the method we follow is not what I had in mind at first, but It’s for now the best solution we can think about. Also, please note that we are not trying to “own” the game, we are only giving people what they are missing to play, nothing more. About community, we have been talking with server admins and clan leaders because If this will be a success, we need the help of the community, that’s the way we have always been, and even when others laught at It, that’s all that FEAR Combat has left: a Community. About the time, well yeah It was actually longer, but for a hobbyst Is not that bad and I’m happy with the result; suggestions and criticism are welcome, we will be happy to have more community activity once the beta go public. Well, you haven’t been talking to me Fred! I would like to offer the full support of RAW. We have a lot of resources. You can contact me via our forum if you want. Creating gamekeys for a game is “owning” or “cracking” a game. We’ve just minded it forward. Why do you think Fear had got more thousands of players 2007 at one time, thousands of players 2008, 2009 amount sinked to 800, 2010 500-600, 2011 400 and finally 2012 150 Players. Don’t you see any pattern in it? Except the special gameplay fear doesn’t offer anything interesting to players nowaday. So, all players need to update…that is fact !!! I know you are right thinking the game needs more than keys, but starting over again is not as easy as you have already noticed. In the end, players will choose what to do., and we are offering an alternative for existing and new players, together. So, how do you manage to combine original gamekeys with own generated gamekeys? Yayyyyyy!!!!!!! I got my new cd key.Ok Whip I am waiting for your reply or feedback.BTW we will do all communicating on this matter on xfire.I have a few more ideas I would like to share with you to make this work. How do I get a new CD key!? where where drooling! You guys should really stop being picky and stuff, Fred’s trying his best to make this game work again, and all you are doing is insulting his work. There’s some stuff he just can’t do because he isn’t the developer of the game. Deal with it, I am very happy with what Fred has done and is doing. Thanks buddy! Please remember to include Pheeze in the credits, all this would have been impossible without him. We aren’t insulting. Be realistic !!! Fear Combat could have be his comeback last November. FEAR can’t allow 2 parties to do to the same stuff in a different way. For us it seems that fred just wanna be the leader of this community. Think about it a work, that isn’t as good than ours, needed more than 3 or more months. We had done it within a week. Indeed how far would u be with your work without the earlier work of Demic? Egoistic nonsense is still going on and isn’t help a dead game !!! 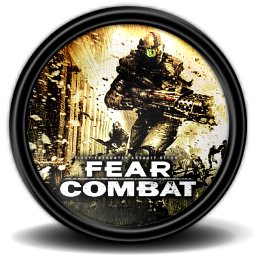 Ok, If we are going to talk realistic, INFEAR couldn’t be FEAR Combat comeback, It was indeed a replacement. The first time we talked about this was in the ESL Forums and you laught ar the keyless idea saying why would someone want that, and why do people duplicate work ( but I didn’t even know you were working on something, until we started talking about It, but you said you were already done with It, and we were starting ). He was cool enough to give us some help when we started this, obviously we needed a lot more time than him, that already made mycmd, we were starting from scratch. And finally, the reason we didn’t join, is because INFEAR was aiming to kill an almost dead, but still played Game, to make people play a ‘new’ but starting from scratch and without players game. We discused this to the boredom, and he always refused to consider the possibilities that INFEAR might have big issues getting new players, and In the end It happenes that way. And the reason was not INFEAR being not good enough, or the key system, or me, or you, HassL, the reason is what I told you that time: If you get a new player, and he joins, and see the servers empty, he will go away and most probably won’t come back again. In a final note, I’ve never aimed to be the leader of anything, there are people more qualified for that than me, I barely can play nowadays, I’ve been doing this on my sleep time and once It’s ready, It will be for the community, not for me. As I’ve been telling you since the beginning, in the end the players will choose what to do, and looks like they choose to just keep playing FEAR, is all that we want. BTW the keyless mode works too, but keys are implemented to make regular bans work ( we got IPBans too ). Dude, I told that point about new players to you as I ask u to upgrade your server. you don’t have a clue what our plans are and what we are currently doing. yeah, but we didn’t consider switching to INFEAR as ‘upgrading’, for all the reasons we discussed. And you are right, we don’t know what you are working on, I hope something good, I personally liked most of the INFEAR Features, and I think It has a chance as a special version of the game ( very promod-like ). @HassL: Our project has nothing to do with INFEAR, and I find your comments posted here offensive. We are not obligated to “upgrade” or change our servers so that your project will become successful. We are not obligated to merge with your project, nor you with ours. where are the new keys? I’m an old player and would like to with friends the game back in the live call. but apparently one of the operators do not want it because the main share the money with the 3 games must be earned first or I understand that wrong? 1. I just posted a public visible comment and not a part of a private chatprocol. 2. Going into a company structure is the idea for giving the game a full time support that also should enhance earning money with it. Getting new players to the game has nothing to do each other? Sure in addition our targets are to ease the usability and installation for the user (autoupdating), kill the bugs, update the optic, recode the netcode, adding more features and gamemodes. You talked about we are killing the game…We’ve just killed the version fear v 1.00-1.08. Sure, that shouldn’t supported by you guys, because it is definetely killing the game. !!! P.S. I’m just writing, because your acting is purely hypocrisy !!! I really don’t know why you guys are arguing! As far as we at RAW are concerned INFEAR was virtually dead from the start. We were not about to rely on a third party system, nor would it seem did the rest of the FEAR Community. 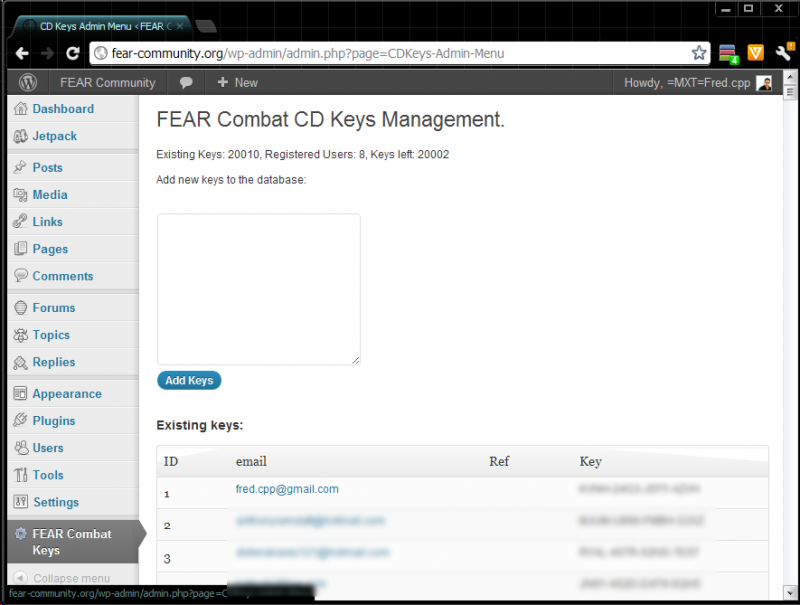 Nobody has killed FEAR v 1.08, it’s still alive and RAW fully supports SEC2. We have implemented it on all of our servers and are willing to work with Phreeze and Fred to promote their project further. Now that the key problem has been solved, I intend to put up a new page on our website promoting FEAR with links to FEAR Community for getting the keys. I think now we can put our differences aside an assist each other.I was implying that like ages ago.We don’t want to own FEAR we cant however all we want an our soul mission is to keep it alive.We are not a conglomerate after money or trying to apply a company structure,we are just merely trying to populate ALL our servers once more.I said it before and I will say it again I did ask for us to combine forces and conquer that would have been so awesome. Do you even know what you are talking about? 😀 SEC2 provides new Keys, how do you think they check if the keys are valid? Magic? 2.) You are connecting to “MasterServer” and let that particular server check the key or more the hash of that key. So because i dont think that Fred and Co. are that dumb to use method 1 for validating their keys .. You are indeed using a “third party system” while supporting SEC2. demic, I said that “we were not about to rely on a third party system” and I stand by that comment. I wasn’t claiming that we aren’t using one at present. We are not reliant on SEC2 for anything other then new players being able to use the keys generated by it. Our own new members are issued with genuine CD-Keys to use and if at any time we were to stop using SEC2 it would make absolutely no difference to us. Now, I don’t know about INFEAR and as their website is no longer available, I could not check but my understanding is that it was a more complicated system and didn’t work as simply as SEC2. I have no problem with using third parties but we will not be dependent on them. I hope I have made myself clear enough this time! What’s the big deal…who cares about a third party…I in fact love parties..lol.. The main point is now new players can play FEAR and get addicted like all of us! @Morda Some people like to troll, lucky for us those that care more about the game then personalities will always put the game first, that’s why RAW will continue to support SEC2. I think this is the third thread tonight that I have said that I like the video, it wasn’t perfect but it was very well made and got the point across perfectly. My hat goes off to you. Thanks alot Rebel really appreciate it. And the team and I support RAW and you fully likewise. Yea all we want is the luxury and peace of mind that the project continues to aspire and we develop a greater personality along with it. Just pointing someting out. We are currently talking to “fear-com.org” team to get agreement or something. We are still working, because we love this game, but this game is still far away from being perfect !!! That is our PATH !! !